Slavery. Abolition. States’ Rights. The Union. To commemorate the 150th anniversary of the Civil War and in partnership with the statewide Pennsylvania Civil War 150 efforts, the Beaver Area Heritage Museum will host the Senator John Heinz History Center’s new traveling exhibit, The Civil War in Pennsylvania. Beginning March 31, 2012, and continuing through April 22, 2012, this 500 square foot exhibit will be on display, followed by the museum’s own Civil War exhibit from April 29 through Labor Day. Normal hours are Saturdays, 10 a.m. to 4 p.m., and Sundays 1 p.m. to 4 p.m. The Heritage Museum will be the first venue to host the exhibit, which then will tour 40 or more sites throughout the region, each for a period of three to four weeks. View the photo album from the exhibit’s launch reception with Heinz History Center CEO Andy Masich with dozens of our volunteers, corporate supporters and donors. While the battles that determined the fate of the Union were not fought in this region, no life went untouched by the conflict. As the “Arsenal of the Union,” Western Pennsylvania provided both the industrial might and the infantrymen that brought victory for the North. In fact, the Commonwealth’s greatest resource might have been its citizens — more than 340,000 Pennsylvanians, including 8,600 black troops, served in the Union Army, a number second only to New York state. Pennsylvania played a critical role in the war providing industrial might, agricultural bounty, and natural resources. Those on the home front raised funds to support troops on the field, on the move, and in hospitals. Women took over running the family farm, provided care packages, wrote letters with news from home, and offered prayers for spiritual support. More than 80 percent of the iron used by the Union came from Pennsylvania and it was fashioned into railroad rails, artillery and ammunition. The fertile Cumberland Valley provided flour and meat to feed troops. And nearly all the coal used for fuel came from Pennsylvania mines. The war touched every Pennsylvanian’s life. The Civil War in Pennsylvania exhibit will present their stories. The display will feature four life-size historic figures, plus Dog Jack, along with modular panels describing Pennsylvania’s contributions to the Civil War and display cases to be used for items from the collections of the local history organizations hosting the exhibit. Also included in the exhibit are curriculum materials that meet Pennsylvania and U.S. social studies standards, and other hands-on educational objects, such as replicas of historic items, for students to explore. Strong Vincent – Born in Erie and a graduate of Harvard, Strong Vincent was a young attorney when he enlisted in the Union Army in 1861. In the fierce battle on Little Round Top in Gettysburg, Vincent rallied flagging troops with the shout, “Don’t give an inch!” A moment later he was struck by a bullet and mortally wounded. Martin Delany – One of the first blacks admitted to Harvard Medical School, Delany, who lived in Pittsburgh most of his life, was a practicing physician as well as an ardent abolitionist. 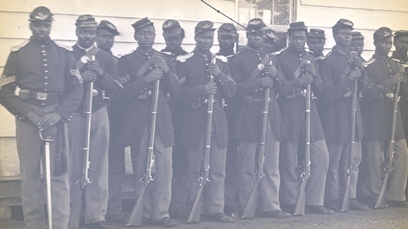 In 1863, Delany began recruiting African American men as soldiers, many of whom joined the newly formed United States Colored Troops. Commissioned a major, Delany became the highest ranking African American in the Civil War. Tillie Pierce – When Confederate troops overran her hometown turning it into a bloody battlefield, 15-year-old Tillie Pierce responded as many women did—she hauled buckets of water for thirsty soldiers, tore cloth into bandages to aid physicians, and comforted the wounded and dying with conversation and companionship. Many years later she wrote her reminiscences of those days leaving an intimate account of the battle of Gettysburg. Although slavery was the root cause of the Civil War, most northern soldiers fought to preserve the Union, not to free the slaves. Energized by President Lincoln’s patriotic rhetoric, early enlistees rallied around appeals such as “Crush the Rebellion,” and “Do You Love Your Country?” In 1863, however, Lincoln issued the Emancipation Proclamation transforming the conflict from a war to preserve the union to a war committed to ending the institution of slavery. Following Lincoln’s example, many Union soldiers also became convinced that the defeat of the Confederacy would also require an end to slavery. The Union Army required a vast support system to wage the war. Troops needed artillery, guns and ammunition, food, clothing, and medical supplies. On the home front, men worked in foundries making iron for armaments of every kind. Women and children manufactured solid shot, explosive shells, and shrapnel-filled case shot. Prominent business men and society women held fund raisers to finance medical care for soldiers. There was a place for nearly every citizen to support troops in the field. The war touched nearly every individual and many women sought ways to connect more personally with soldiers. Traditionally feminine roles such as family care giver, cook, and comforter trained women to provide for needs that the government and industry simply could not supply. Women volunteered as nurses in hospitals and their own homes, provided food for soldiers on the march, and wrote letters of support to loved ones. In 1863, after the Confederate victory at Chancellorsville, Robert E. Lee planned his second invasion of the North.  Moving his troops into Pennsylvania’s rich farmland would provide much needed supplies for his army, give battle-ravaged Virginia the summer to recover, and draw Union forces away from Washington D.C. 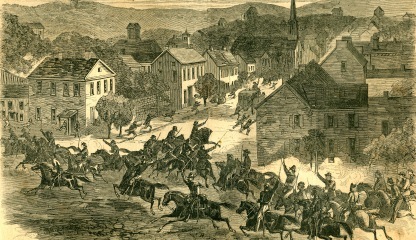 In late June, Lee’s men entered central Pennsylvania and marched through Chambersburg, Shippensburg, and Carlisle before turning south and encountering the Union Army at Gettysburg. The three-day battle that followed was the bloodiest of the Civil War. Pickett’s Charge, meant to be the beginning of a Confederate sweep toward Washington D.C., became a decisive defeat and ended Lee’s campaign in Pennsylvania. This northernmost battle of the War, fought on Pennsylvania soil, became a pivotal moment in the nation’s history. Beaver attorney Richard P. Roberts, Colonel of the 140th Pennsylvania Volunteer Infantry, was killed in the second day of battle at Gettysburg, in action near the famed Wheat Field. 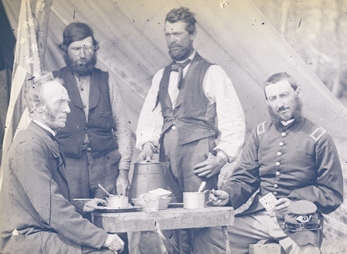 The Civil War in Pennsylvania exhibit is grounded in the recent scholarship developed out of the statewide Pennsylvania Civil War 150 collaboration. Noted American historians, including Ed Ayres, William Blair, Judy Geisberg, James Horton, and Elizabeth Leonard, have participated in all phases of Pennsylvania Civil War 150. This exhibit has been created by the Senator John Heinz History Center and sponsored by Peoples Natural Gas and Institute for Museum and Library Services, in partnership with Pennsylvania Civil War 150. Eaton Corporation is local corporate sponsor of the display.